What Good Have I Done? A new habit that I am working on is writing in my journal before going to bed. What am I writing about? I’m putting my day up for review and noting my short-comings. I am looking at where I went wrong and how I can do better in the future. Did I allow my temper to get the best of me? Did I not do the things I wanted to get done? I look at where I went wrong, but there is a question I don’t usually ask myself. What good did I do today? Yesterday, I did a lot of good things for myself. I got up early. I exercised, read, and wrote. I drafted a future post on the virtue of Temperance. I went to work. I went about my day as usual and did a lot of good things -for myself. To my knowledge, I didn’t do anything evil. I don’t even remember having any bad thoughts. But did I do any good? I did what I felt was right, but is this enough? I didn’t see an opportunity to do a good deed, but was I really even looking? When I came home, I found out my son got in trouble at school. He hit someone for no reason. I asked him why. He said because he wanted to. He was not provoked nor upset by the other person. He, for no apparent reason, wanted to hit the other boy. I did my duty as father. What is my duty? As a father, it is my duty to raise a boy into a strong and productive man that can contribute to society when he gets older. He has his name and reputation to protect, even at the age of six. He cannot do that if he is being a bully. 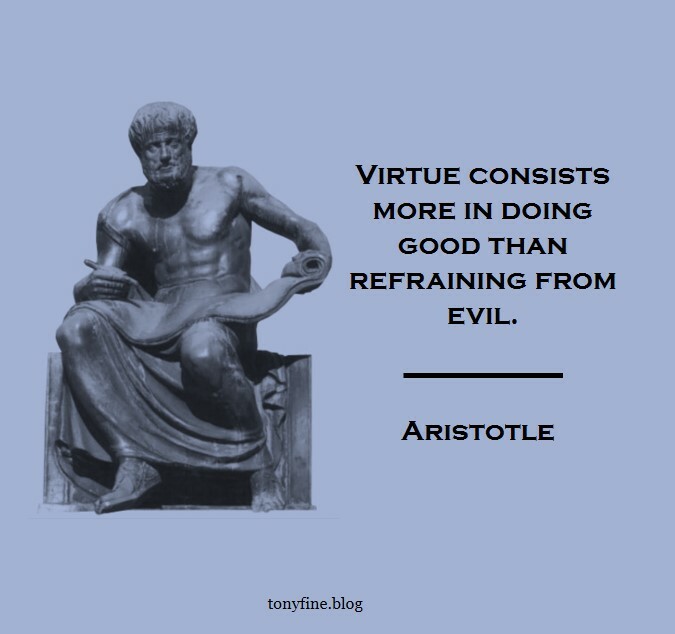 He must actively do good and not only refrain from evil. “What good did I do today?” It is good that I did my duty. But if he did not get into trouble, would I have done any good? My plan after work was to play with my son. We were going to exercise a little, wrestle a bit, and then get into some Legos. My “good” was in being a good father and husband. It may not seem remarkable to some, but I view it as my sacred duty. Yet I could have done more on this day. I will catalog it in my journal and make the attempt to do more “good” tomorrow. Again, thank you Chip for creating this awareness to actively do good.